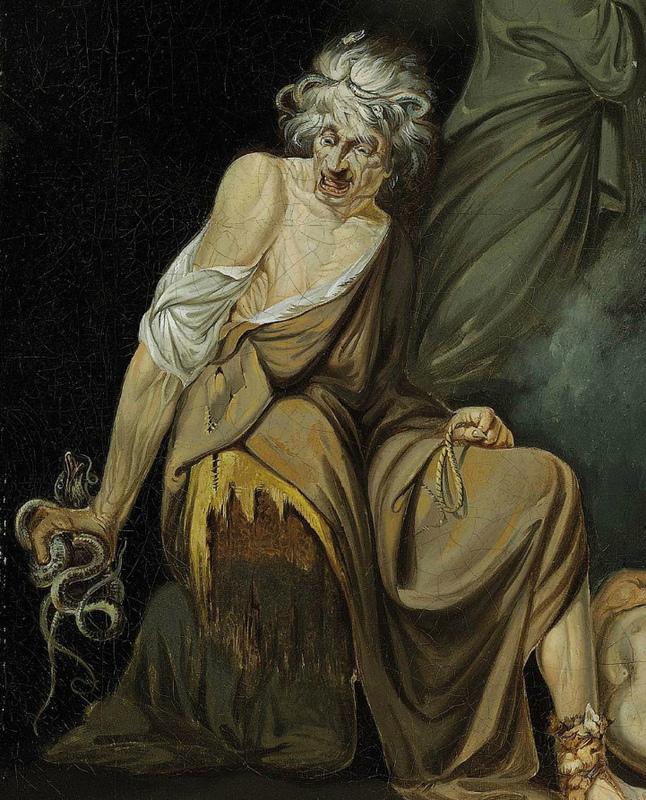 In my Halloween blog-post last year, I introduced the ancient Roman witches, Canidia and Sagana, and suggested that they might well have had counterparts in Roman London. Roman literature, however, presents us with an even more terrifying witch, in the person of Erichtho, first referred to, it would seem, by Ovid, in his Heroides. 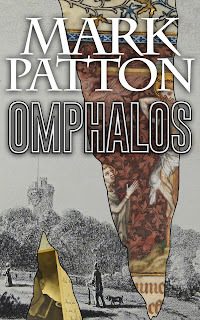 Ovid places her in Thessaly, a rural province of Greece which seems to have been infamous for witchcraft long before his own time in the First Century BC. The witch, Erichtho, by John Hamilton Mortimer (1740-79). Licensed under CCA. Erichtho plays a much more prominent role in the work of a later poet, Marcus Annaeus Lucanus (Lucan), the nephew of the philosopher, statesman and dramatist, Seneca. 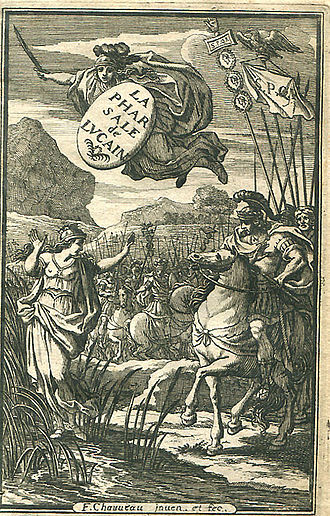 Lucan's epic poem, Pharsalis, deals with the Roman Civil Wars of the First Century BC. 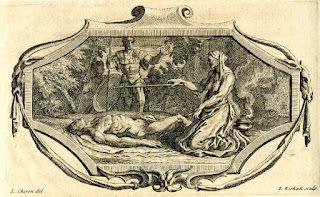 In the poem, Sextus Pompeius, the disreputable son of the revered statesman and soldier, Pompey the Great, consults the witch on the eve of his father's defeat at the hands of Julius Caesar. 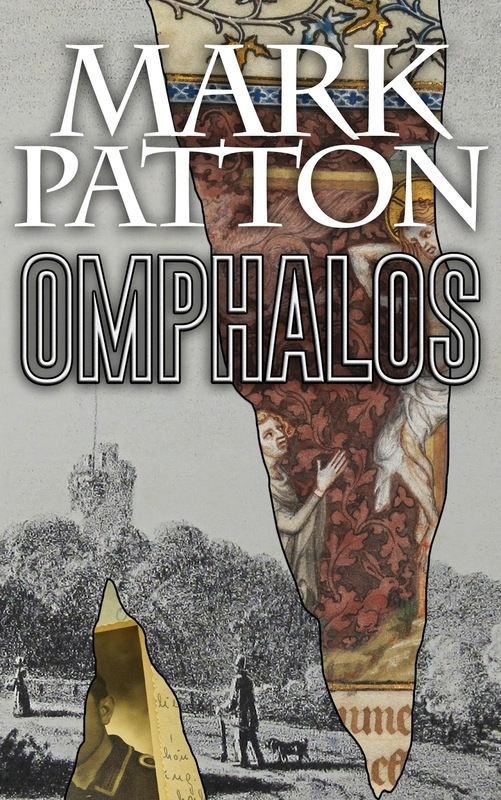 She searches a battlefield for the corpse of a recently slain soldier, which she reanimates, to help her predict the future. Denarius of Sextus Pompeius, depicting the lighthouse of Messina, and the monster, Scylla, believed to live in the straits. Photo: Classical Numismatic Group (www.cngcoins.com); licensed under CCA. 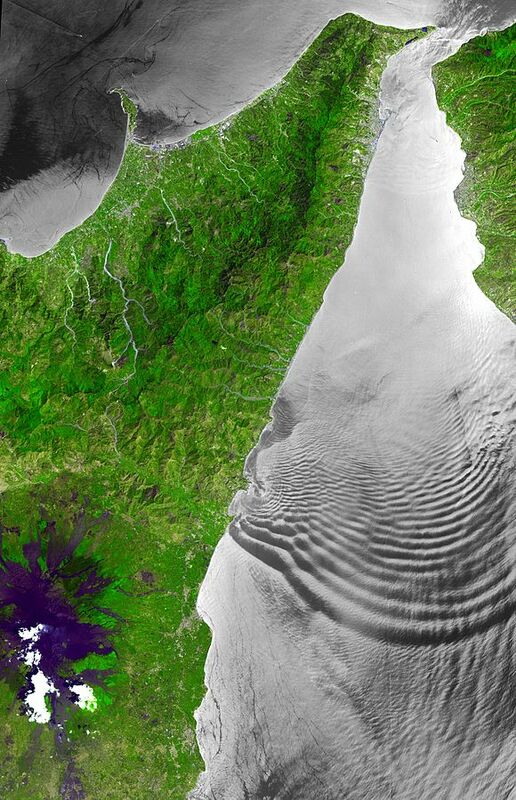 The Straits of Messina, between Italy and Sicily, where Sextus Pompeius had his naval base. The tidal flows are thought to have given rise to the legends of Scylla and Charybdis. Photo: NASA (image is in the Public Domain). Leaped from the earth erect the living man." 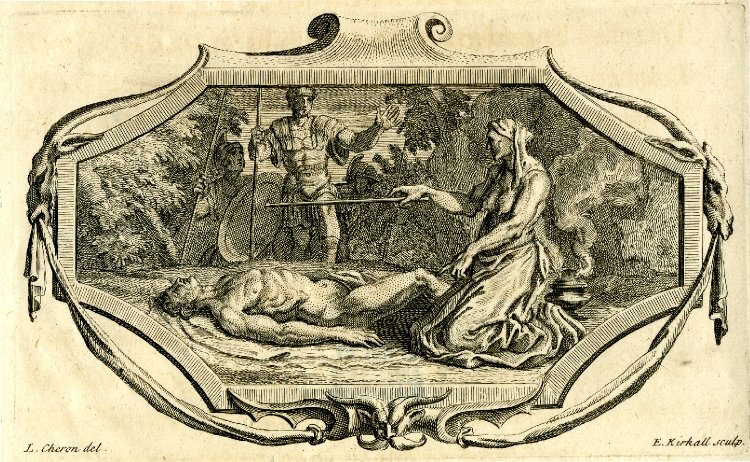 Erichtho reanimating the corpse. British Museum (image is in the Public Domain). Erichtho is mentioned by Dante, in his Inferno, from which it is reasonably clear that he has read Lucan, as well as Ovid, but it was with the rise of printing in the Fifteenth and Sixteenth Centuries that the works of these classical authors found a wider readership, both in the original Latin, and in translation. Erichtho, together with Canidia and Sagana, is a lineal ancestress of the "weird sisters" of Shakespeare's Macbeth. The circulation of these texts is accompanied by a renewed interest in necromancy and witchcraft: the Oxford English Dictionary first records the word "necromancy" in 1456, and "Halloween" in 1556. 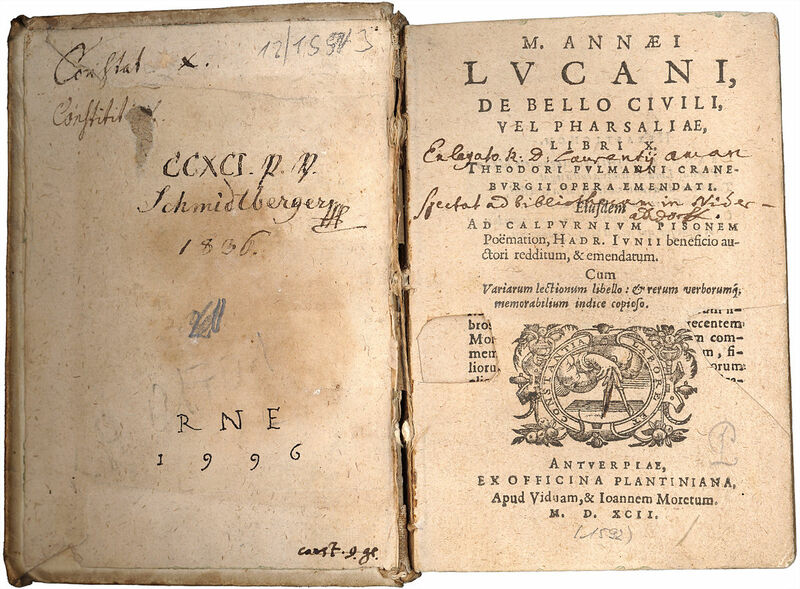 Lucan's Pharsalis, a Latin edition of 1592 (image is in the Public Domain). Lucan's Pharsalis, frontispiece to a French edition of 1657 (image is in the Public Domain). Shakespeare's contemporary, John Marston, includes Erichtho herself as a character in his play, Sophonisba, or The Wonder of Women, and transforms her into a sexual predator, luring young men to her bed under cover of darkness, so that they are unaware that they are copulating with a monstrous hag. 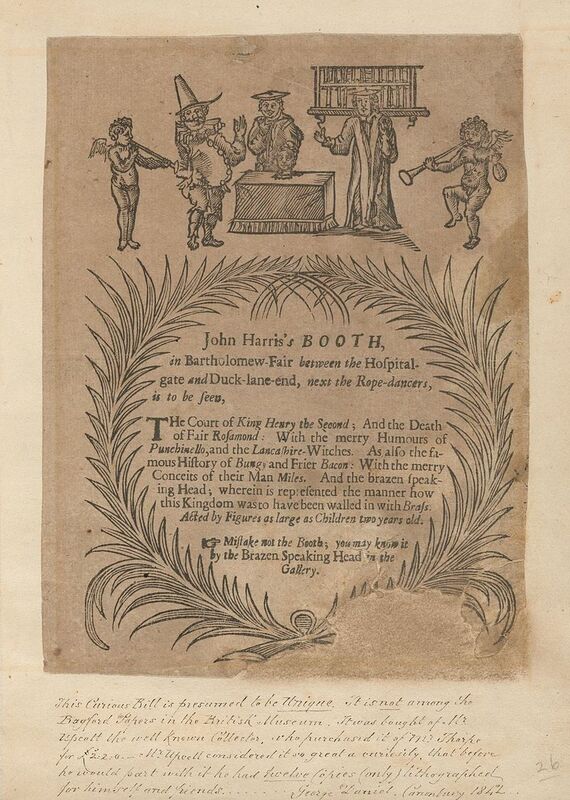 Although rarely performed today Sophonisba, which premiered at Blackfriars in 1606, was as much a commercial success in its day as many plays by Shakespeare or Ben Jonson. The image of the witch as both hag and sexual predator, a seducer of men of previously good character, became far more familiar from this time: there were many more witch trials (mostly of women) between 1580 and 1650 than there had been throughout the supposedly "superstitious" Middle Ages. In a Christian world, however, these latter day "witches" had acquired a dimension that the Classical Erichtho, Canidia and Sagana never had: as agents of the Devil in a war for Christian souls. Witches, by Hans Baldung, 1508 (image is in the Public Domain). The volcanic islands of the Hawaiian Archipelago are spread out over 1500 miles of the Pacific. They are among the most remote land masses on Earth, and among the most recently settled by humans. 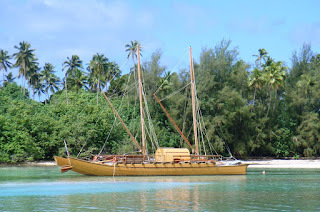 The first Polynesian settlers seem to have arrived in around 124 AD, but most indigenous Hawaiians are descended from a later wave of voyagers who set sail from Tahiti in around 1200, bringing with them pigs, chickens and dogs; taro, breadfruit, bananas, coconuts and sugar-cane. 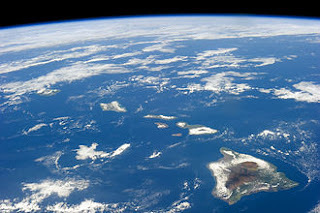 Hawaii from Space. Photo: NASA (image is in the Public Domain). 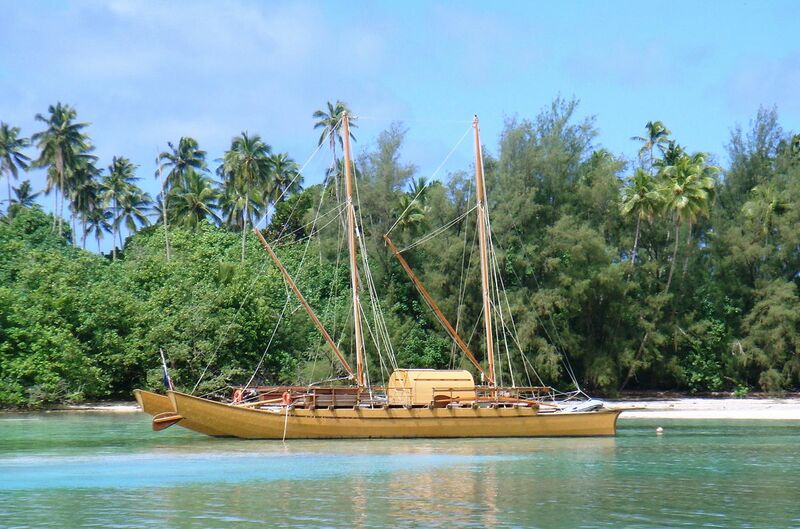 A Polynesian double-hulled "vaka," of the sort used in the initial colonisation of Hawaii. Photo: Teinessavaii (licensed under CCA). Captain James Cook visited the islands in 1778, and went on to lose his life there the following year, in the course of a dispute with the native people. From Cook's crew, and from subsequent interactions with Europeans, the Hawaiians acquired firearms, which were used by King Kamehameha I (1736-1819) in the forcible unification of the disparate island communities under his sovereignty. 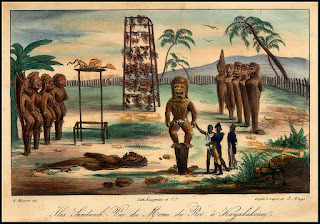 The Hawaiian ritual site of Kailua-Kona in 1819, by Jacques Arago (image is in the Public Domain). Unlike many other territories in the Pacific, Hawaii was not forcibly settled by an imperial power. Protestant missionaries came peaceably from the United States from the 1820s, and, in their wake, came commercial settlers. The American, William Hooper, in 1835, leased 980 acres of land from King Kamehameha III, and developed the islands' first commercial sugar plantation. Others followed, to establish pineapple plantations. Within a few decades, much of Hawaii's land was in the control of a handful of intermarried Haole (white) families, all of them descended either from missionaries or from businessmen from the United States. 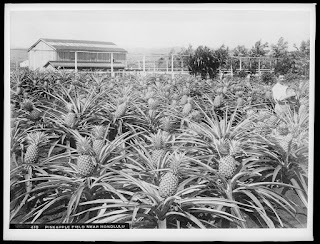 A pineapple field near Honolulu in 1907. 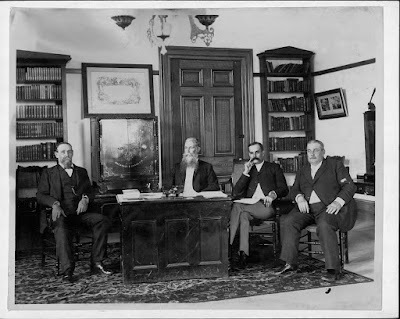 Photo: California Historical Society (image is in the Public Domain). 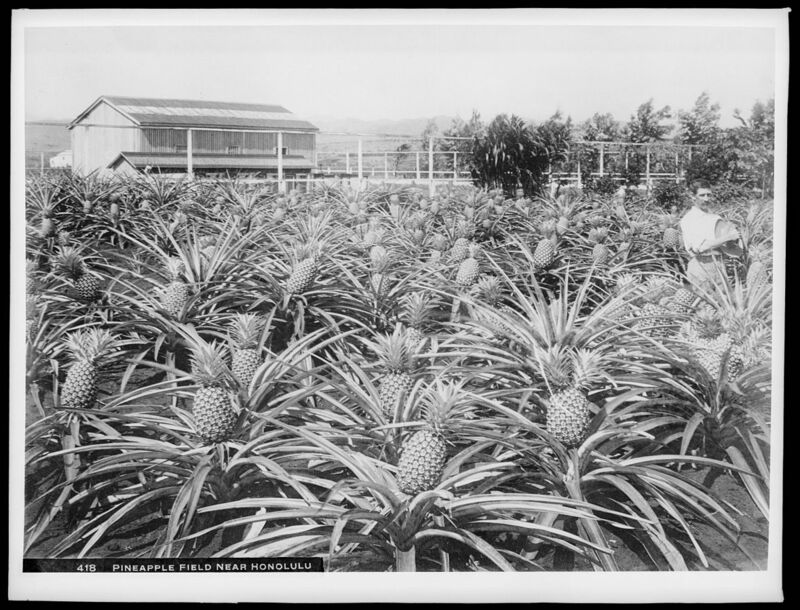 Pineapple canning in Hawaii, 1928. Photo: US National Archives & Records Administration, NWDNS-86-G-5F (8) - image is in the Public Domain. 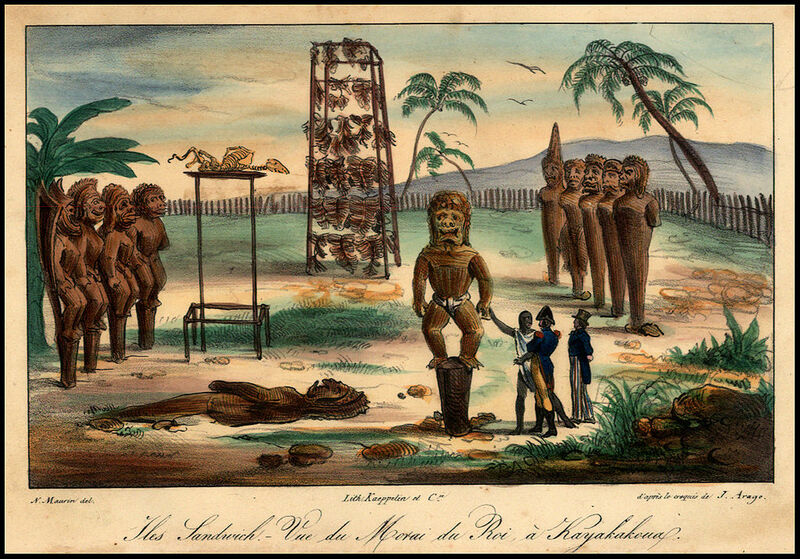 The indigenous population, meanwhile, had been devastated by diseases, including smallpox, measles and chickenpox, brought to the islands by the American settlers, whose plantations became increasingly dependent on immigrant labour. Between 1852 and 1920, 50,000 Chinese, and 200,000 Japanese, men, women and children made their way to Hawaii, the Chinese bringing with them yet another deadly disease, leprosy. 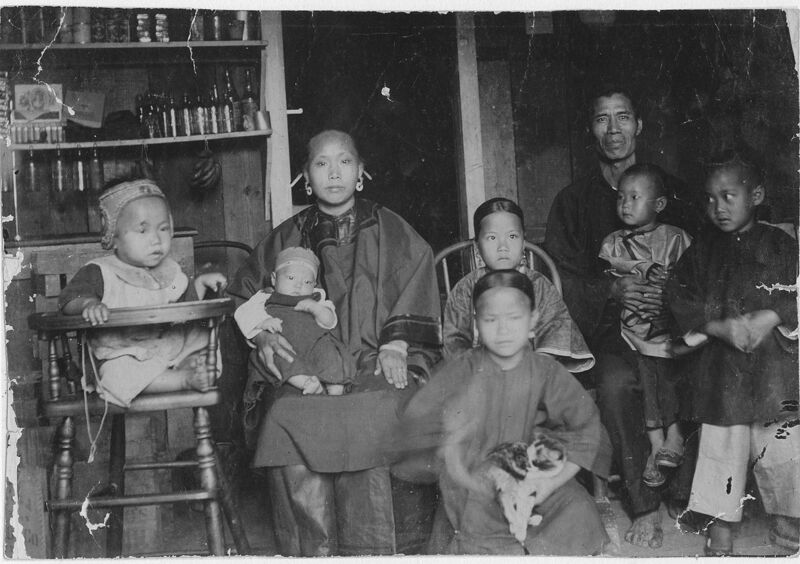 A Chinese family in Honolulu in 1893. Photo: Hawaii State Archives (image is in the Public Domain). By 1893, the indigenous population had become so weakened, and the five largest American companies on the islands so powerful that, with limited assistance from the United States Navy, the commercial interest was able to stage a coup d'etat, deposing the last native Queen, Lili'uokalani. The "Republic of Hawaii" that replaced her monarchy was entirely dominated by white American oligarchs. 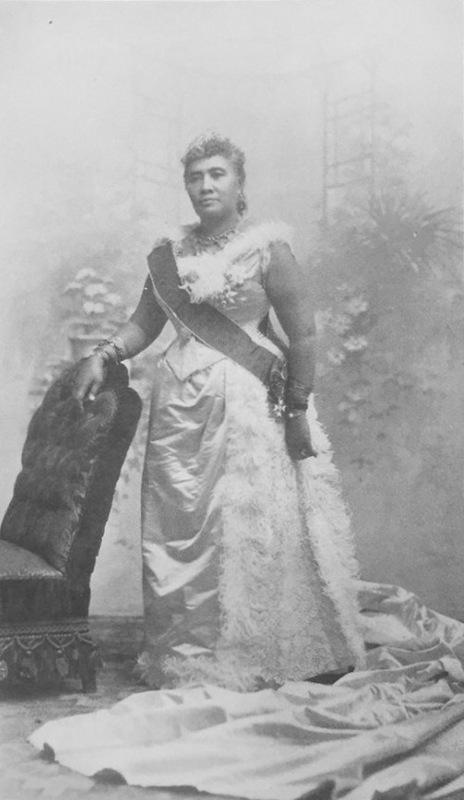 Queen Lili'uokalani in 1898 (image is in the Public Domain). 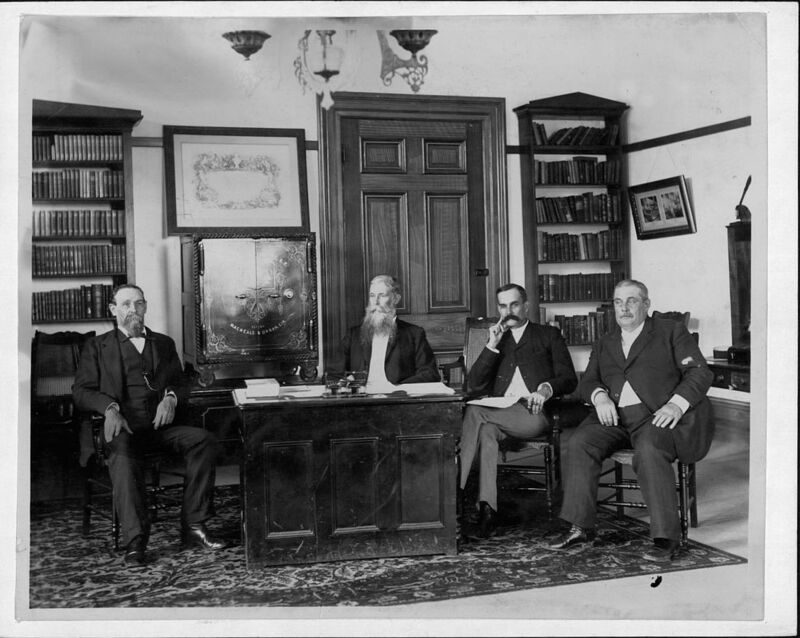 The Provisional Government of Hawaii in 1893. Photo: Hawaii State Archives PP-28-7-012 (image is in the Public Domain). In 1898, US President William McKinley annexed Hawaii as an overseas territory, appointing one of the oligarchs, Sanford B. Dole, as its first (Republican) governor. 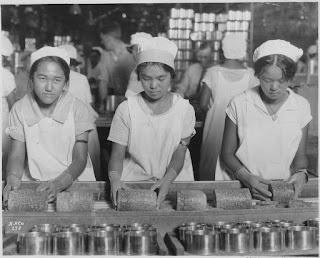 During the decades that followed, indigenous, Chinese and Japanese Hawaiians struggled to achieve equality, both politically and in the workplace, with their white neighbours. In 1954, following a wave of strikes and civil disobedience, the stranglehold of the oligarchy was finally broken, the Democrats beating the Republicans in territorial elections. In 1959, Hawaii became the 50th State of the Union, and, in 1993, President Bill Clinton formally apologised for the coup of 1893. James A. Michener's novel, Hawaii covers the whole period of the islands' human history, from initial settlement down to the time of the book's publication in 1959. Its six inter-related story-lines deal with the environment; and with the lives of several generations of an indigenous family; an American missionary/commercial family; a Chinese family; and a Japanese family; before bringing these stories together in an exploration of post-Second World War Hawaii. "In 1946, when Nyuk Tsin was ninety-nine years old, a group of sociologists in Hawaii were perfecting a concept hose vague outlines had occupied them for some years, and quietly among themselves they suggested that in Hawaii a new type of man was being developed. He was a man influenced by both the west and the east, a man at home in either the business councils of New York or the philosophical retreats of Kyoto, a man wholly modern and American yet in tune with the ancient and the Oriental. The name they invented for him was the Golden Man." 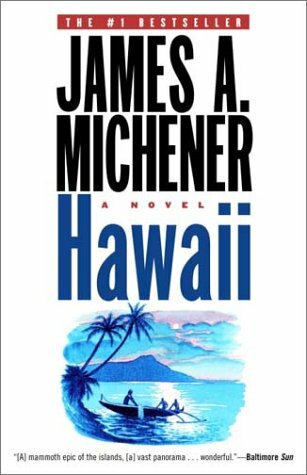 "In 1946, when the war had ended and Hawaii was about to explode belatedly into the twentieth century, Hoxworth Hale was forty-eight years old; and one morning, when the trade winds had died away and the weather was unbearably sticky, he happened to look into his mirror while shaving, and the thought came to him: 'This year I am as good a man as I shall ever be in this life ... ' as the hot, muggy day closed in on him he was forced to inspect the two areas in which he was no longer so good a man as he once had been. First, there was the gnawing, never-ending pain that started when his son Bromley was shot down during the great fire of Tokyo in 1945, when the air corps practically destroyed the city ... he picked up the thoughts that is son had laid down: 'We live in a web. Sugar cane, Hawaiian ghosts, pineapple, ships, streetcar lines, Japanese labour leaders, Aunt Lucinda's memories.' The web became most tenuous, and at the same time most cruelly oppressive, when it involved the upstairs rooms where several of the great families kept the delicate women whose minds had begun to wander past even the accepted norm, and in one such room Hoxworth's own wife passed her days." 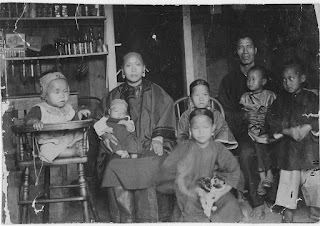 "Hong Kong thought of himself as pure Chinese, for his branch of the family had married only Hakka girls, and whereas there were a good many Kees with Hawaiian and Portuguese and Filipino blood, he had none, a fact of which he was quietly proud. Of course, from past adventures of the Kee hui Hong Kong's ancestors had picked up a good deal of Mongolian blood, and Manchurian, and Tartar, plus a little Japanese during the wars of the early 1600s, plus some Korean via an ancestor who had traveled in that peninsula in 814, augmented by a good deal of nondescript inheritance from tribes who had wandered about southern China from the year 4000 BC on, but nevertheless he thought of himself as pure Chinese, whatever that means." 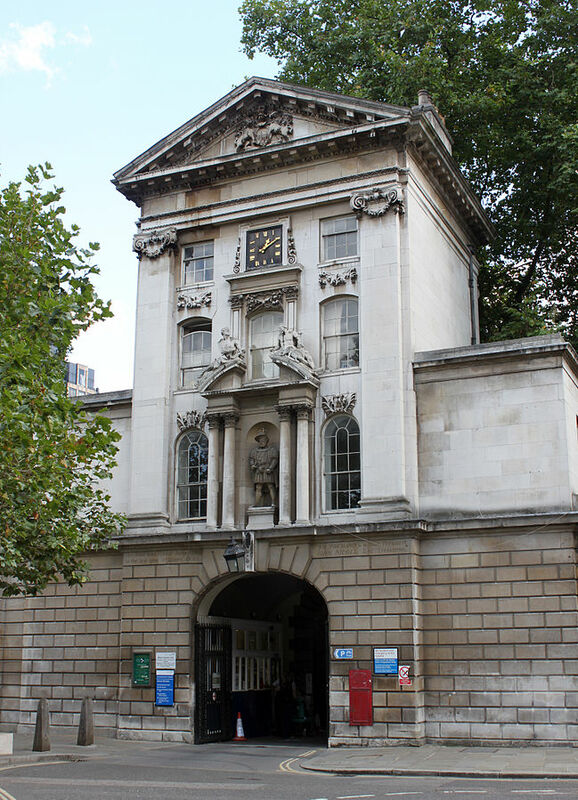 A visitor to London, walking up the Great North Road (Aldersgate Street) can take any one of a number of small passages leading to the west, and thus pass from the Ward of Aldersgate Without into that of Farringdon Without. Such a visitor should, however, allow time for the possibility of getting lost in the confusing maze of alleys and passages, with names more evocative than most of the surviving buildings (the area was badly hit by bombing during the Second World War): Half Moon Court; Cloth Fair; Bartholomew Place; before arriving in a quarter of the City that did not entirely survive the Reformation of the Sixteenth Century, but did, for the most part, survive the Blitz of the Twentieth. It seems that, in the Twelfth Century, a man named Rahere, who was certainly both a priest (a Canon of Saint Paul's from 1115) and a courtier (his counsel greatly valued by King Henry I), and who may also, according to some accounts, have been a jester and minstrel at some point in his life, made a pilgrimage to Rome. 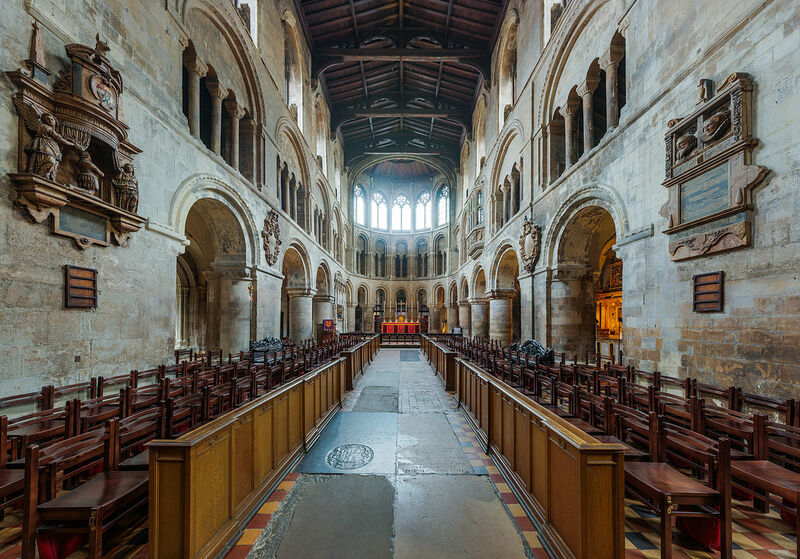 On the way, he was taken ill, and experienced a vision of Saint Bartholomew, who told him that, on his return to London, he must build a hospital. This he did, in 1123, and the hospital, part of an Augustinian priory dedicated to the saint, was London's first. 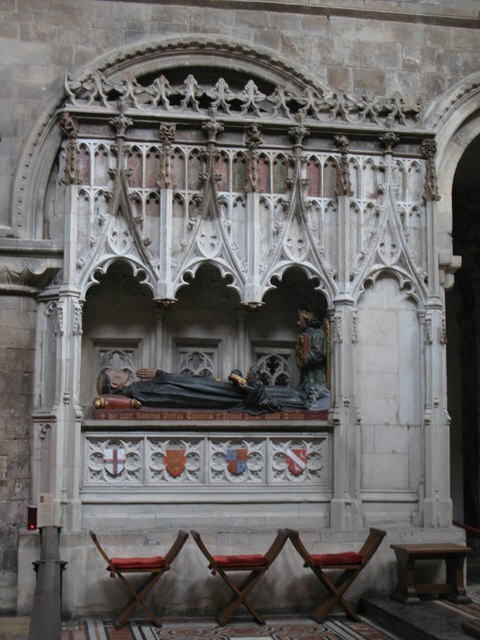 The tomb of Rahere, in the Church of Saint Bartholomew the Great. Photo: Mike Dunn (licensed under CCA). 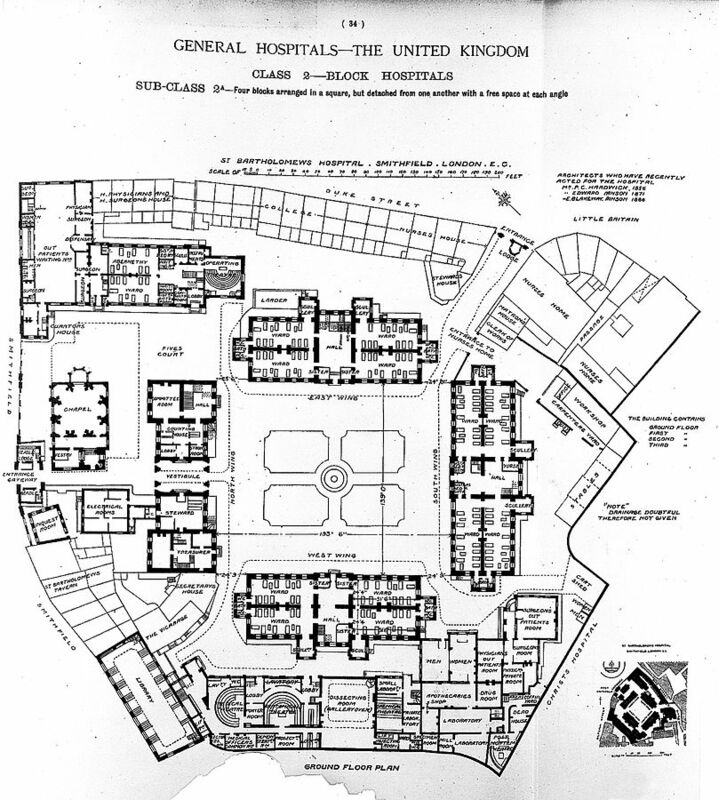 The priory itself, like London's other religious houses, was suppressed under Henry VIII, but he re-established the hospital as a secular institution. 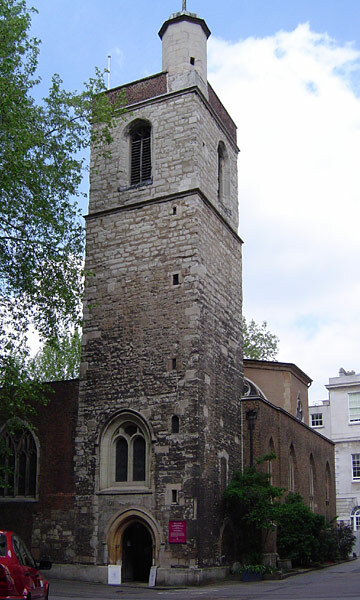 Elements of the Medieval priory, however, are preserved in two parish churches, Saint Bartholomew the Great, and Saint Bartholomew the Lesser. Saint Bartholomew the Great, one of London's best preserved Medieval churches. Photo: David Iliff (licensed under CCA; CC-BY-SA 5.0). Saint Bartholomew the Lesser. Photo: ChrisO (licensed under GNU). The professions of medicine ("physick") and surgery ("chirugery") were quite separate from one another in the Medieval and Early Modern eras. 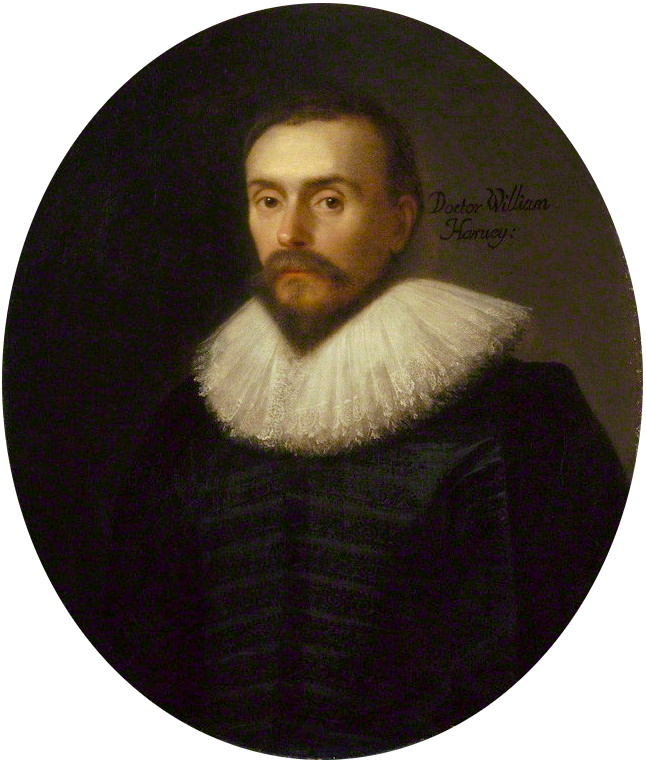 The most famous medical director of "Barts," as the hospital is still known, William Harvey (1578-1657), was a physician trained at the Universities of Cambridge and Padua, and laid down rules that chirugians (who learned their trade by apprenticeship) should operate only under the strict supervision of physicians. William Harvey, by Daniel Myters (1627), National Portrait Gallery (image is in the Public Domain). Harvey, who acted as personal physician to James I and Charles I, conducted pioneering research into the human circulatory system, and took his students into the nearby slaughterhouses of Smithfield, so that they could observe the parallels between the circulation of blood in humans and animals, as the last drops bled from the bodies of cattle, sheep and pigs. In an age in which human corpses for dissection were hard to come by, each student could examine, in detail, the hearts and other organs of a freshly killed beast. 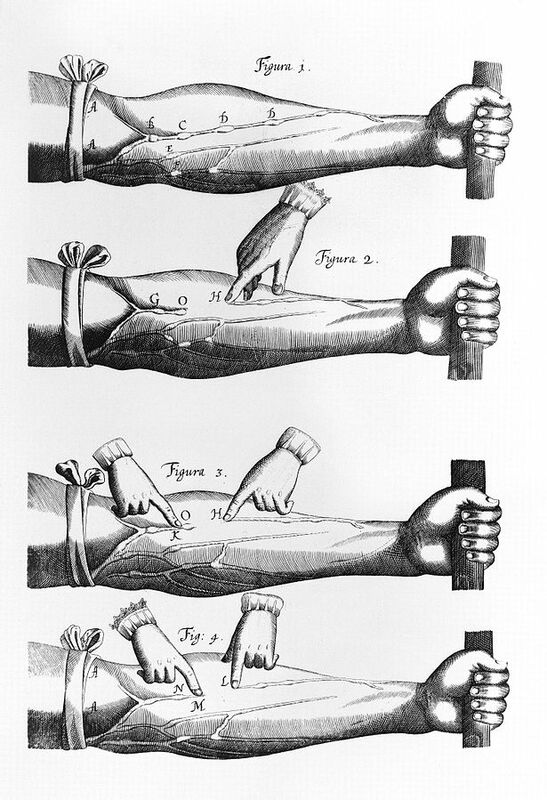 Harvey's illustration of veins in the human arm. Image: Wellcome Collection (licensed under CCA). Four generations later, one of the hospital's most eminent surgeons, Percivall Pott (1714-88), noted an unusually high incidence of scrotal cancer in chimney-sweeps, making him the first to identify environmental factors as potential carcinogens. Percivall Pott, by Edward Hedges, after Nathaniel Dance-Holland (image is in the Public Domain). 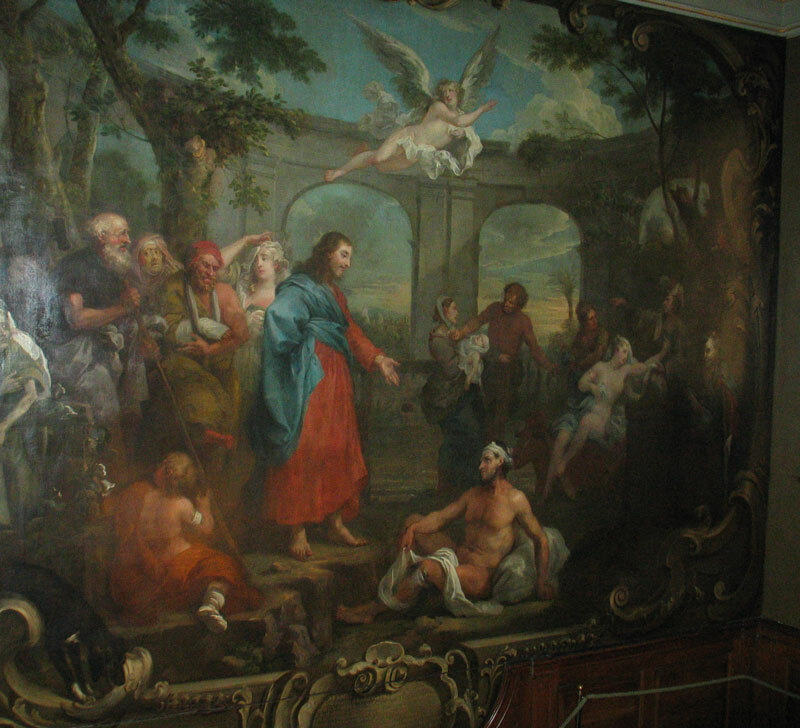 The hospital buildings that can be seen today were built in Pott's lifetime, and William Hogarth, one of the leading artists of the day, was commissioned to decorate them with murals. The main entrance to Bart's Hospital. Photo: Nevilley (licensed under GNU). William Hogarth's mural of Christ at the Pool of Bethseda. Photo: Nevilley (licensed under GNU. Plan of Bart's Hospital in 1893. Image: Wellcome Trust (licensed under CCA). 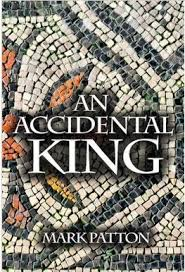 When, back in the Twelfth Century, Henry I had lent his support to Rahere's plan to build a hospital, he also instituted an annual fair within the precincts of the priory, to help with fundraising. 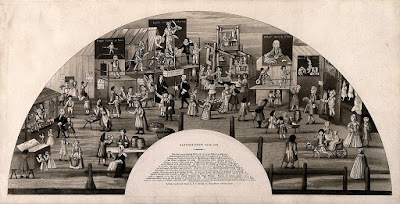 "Bartholomew Fair" took place every August, initially over three days, but this increased to two weeks under Charles II: it was a cloth fair, attracting merchants from all across Britain, but it was also an occasion for much rowdy revelry. Because Saint Bartholomew's lay outside the city walls, the gates could be closed at the normal times, containing the revelers without. Bill for a puppet-show at Bartholomew Fair, 1700. 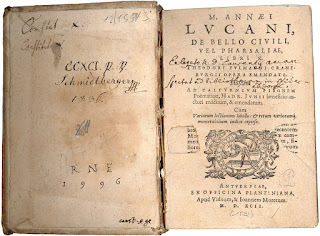 Image, Houghton Library, Harvard University, TS 555.1 (Public Domain). 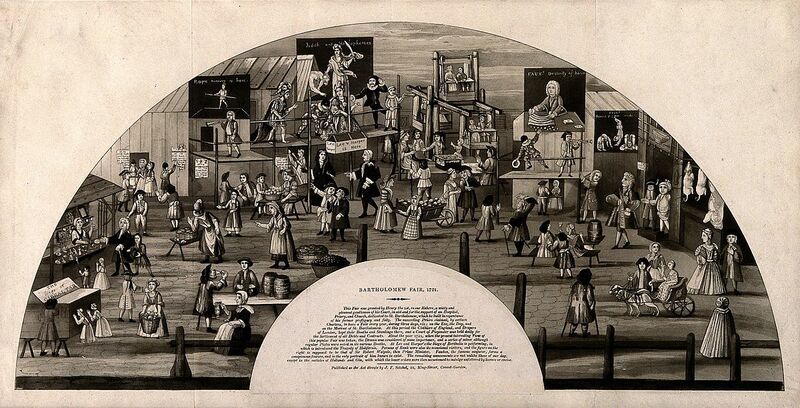 Bartholomew Fair, 1721. Image: Wellcome Collection, V0014666 (Public Domain). By 1855, however, with most of the City's gates demolished, this containment was no longer possible. 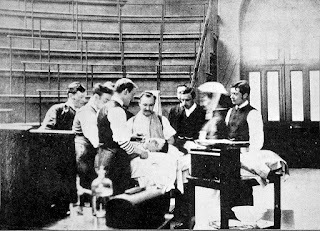 The fair was abolished by the City authorities, but the medical tradition continued, and "Bart's," where the functioning of the human heart was first explained in detail, now supports one of the most important coronary care units in Europe. 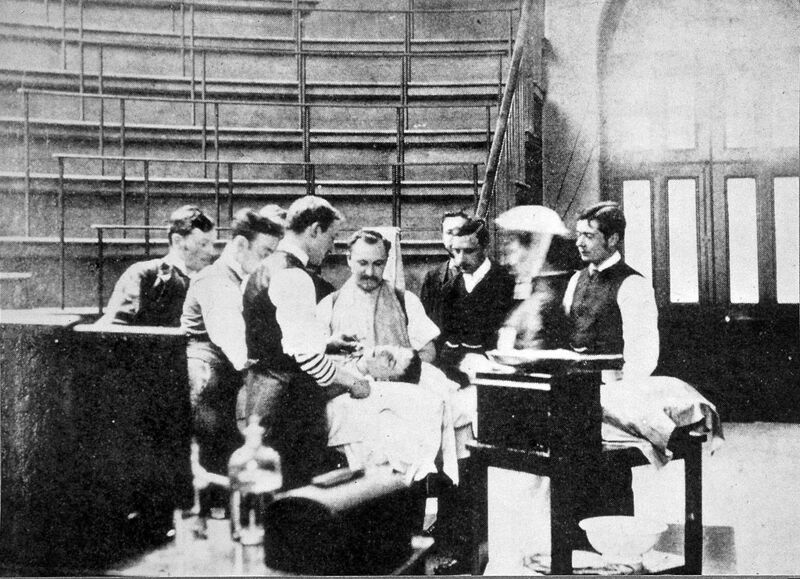 An operation at Bart's in 1908. Photo: Wellcome Collection, L0018253 (licensed under CCA). Having recently explored the Ward of Aldersgate Without, we come, now, to the last of London's City Wards, that of Farringdon Without. This ward, however, is so much larger than any of the others, that we cannot encompass it in a single post, so this is simply an orientation exercise, to be followed by other posts, which will look in more detail at specific elements of the ward. City of London Ward Map, 1870 (image is in the Public Domain). 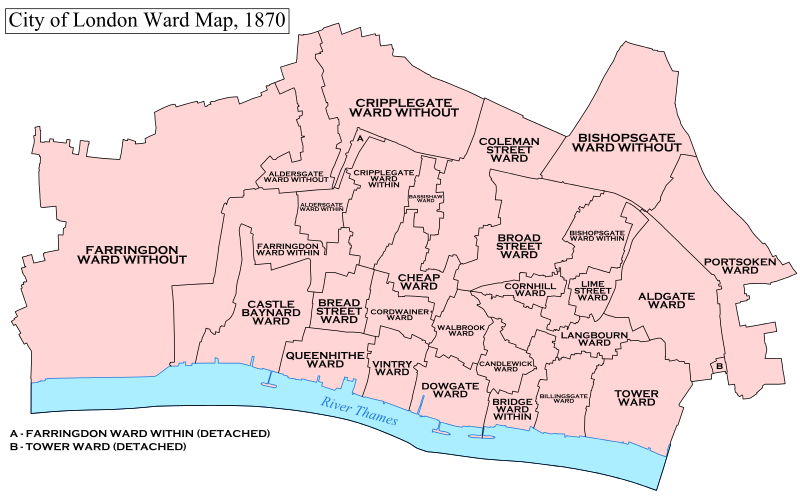 City of London Civil Parishes, 1870. Image: Doc77can (licensed under CCA). 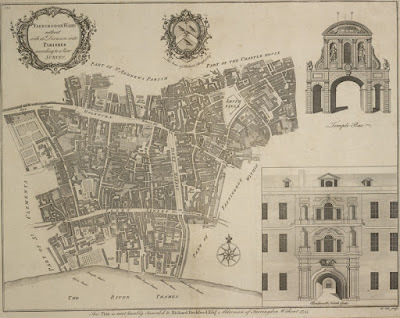 The Ward of Farringdon Without is built around three ancient east-west thoroughfares which, together, connect the City of London to Westminster, Whitehall, and the West End. 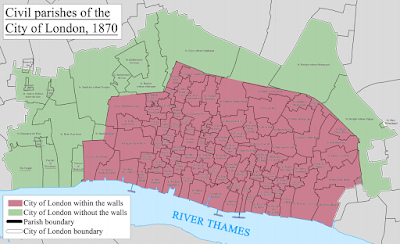 The north-south axis of the ward is today formed by Farringdon Street, but this is, in a sense, simply a ghost of what it replaces - a water-course variously referred to as the River Fleet, or Fleet Ditch, which flowed down (and flows still, although beneath the ground) from Hampstead to meet the Thames at Blackfriars. The Ward of Farringdon Without, 1755 (image is in the Public Domain). Copperplate map of the River Fleet, 1553 (image is in the Public Domain). The southernmost of the east-west thoroughfares, emerging from Ludgate, is Fleet Street. 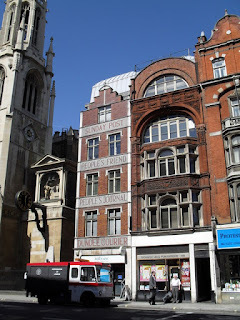 To the south of Fleet Street can be found The Temple, the London headquarters of the Knights Templar until their dissolution in 1312; and the Inns of the Inner and Middle Temple which replaced it, the training grounds for twenty generations of London lawyers. To the north of Fleet Street are the Royal Courts of Justice, beyond which stood Temple Bar (now relocated to Paternoster Square, in the shadow of Saint Paul's Cathedral), marking the western limit of the City of London, and the point at which Fleet Street becomes The Strand. Fleet Street today. Photo: Basher Eyre (licensed under CCA). Fleet Street in 1886, by Ernest George. Image: Pterre (Public Domain). Temple Bar today. Photo: Nessy-Pic (licensed under CCA). 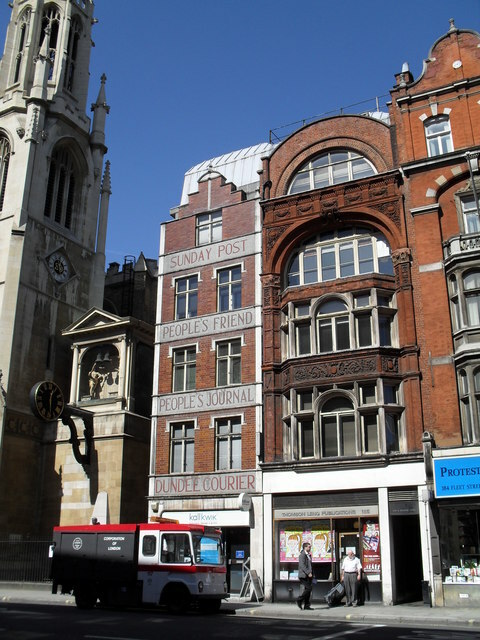 Fleet Street is best known, however, for its association with printing and newspapers. This association began in around 1500, when Wynkyn de Worde established a printing workshop near Shoe Lane. London's first daily newspaper, The Daily Courant, was established nearby in 1702, followed, shortly afterwards, by The Morning Chronicle. 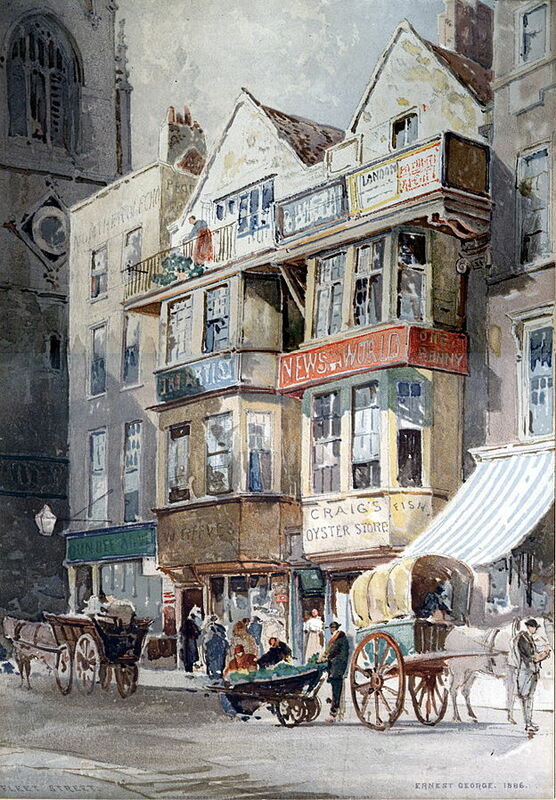 Fleet Street remained the hub of London journalism until the 1980s. 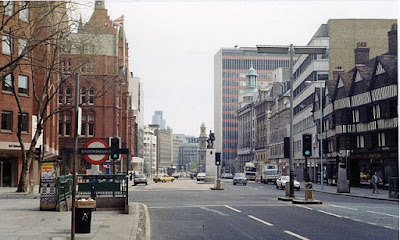 Running parallel to Fleet Street, and to the north, emerging from Newgate, is Holborn/High Holborn, a continuation of the Roman road (Watling Street) running west from Kent to Wales. The coronation processions of Medieval kings started at the Tower of London, and proceeded along this route on the way to Westminster Abbey. 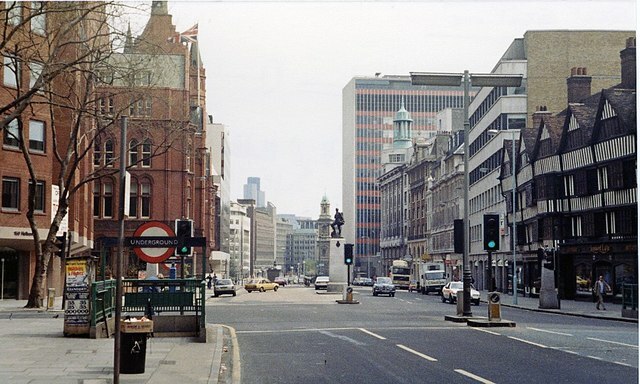 High Holborn in 1984, looking east from the corner of Grays Inn Road. The building on the right is Staple Inn (1585). Photo: Ben Brooksbank (licensed under CCA). The third thoroughfare is West Smithfield, running in a south-westerly direction between the Great North Road and High Holborn. Smithfield has been synonymous with the meat trade since the early Middle Ages: the Twelfth Century chronicler, William FitzStephen, described the sale of horses, sheep and pigs there, which continued into the Nineteenth and Twentieth Centuries. 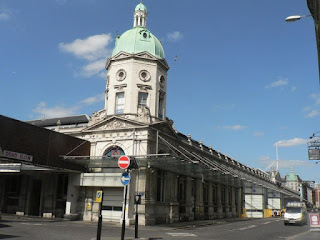 West Smithfield, and the Victorian meat markets. Photo: Chris Downer (licensed under CCA). Over the coming weeks, we will explore these streets, and the lanes running between them, and we will begin, where we left off last week, on the Great North Road. Labels: Farringdon Ward Without, Fleet Street, Holborn, London history, Smithfield.